Pictures show two coats with a Seche top-coat, application is fine, a little sheer on the first coat, but it builds up nicely on a second. 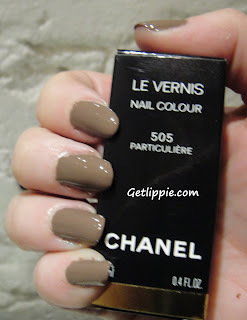 Apologies for the appalling lack of cleanup in these pics, but I wanted to show you the swatches as soon as I possibly could … I like it an alwful lot more than the last Chanel special edition I bought you, which was Kaleidoscope, and I hated it. Normally I avoid browns – I’m scared of them – but this is one I think works quite well with my skintone. oh I was hoping it would be a tad less warm. Thanks for the swatches! Lemming killed! The nails are indeed, lovely and I love the placement of your watermark in the first pic. Personalised nail polish, hmm? Although I really dislike the colour and wouldn't wear it myself, it actually looks really good on you. 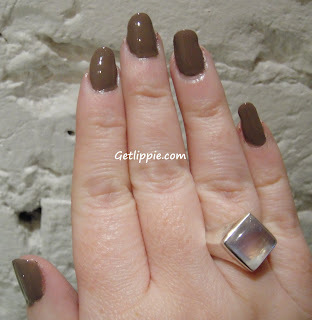 You pull off the taupe thing a lot better than others I've seen this shade on! love love love love love it!!!!!!!!!!!! it's here! goddamit i so don't need any more nail polish but I cannot resist browns! Get Lippie by LAW is licensed under a Creative Commons Attribution-No Derivative Works 2.0 UK: England & Wales License.